Four big sets, starters and boosters, with 120 rare cards for the first three and 60 for the fourth. You need at least 4 boxes and some trade to complete each of them. If you dare the sets are also available in foil version, one rare, two uncommons and three commons foil each box (more or less), so you need 120 boxes to have the possibility to complete the set (simply crazy!). The fourth big set has only 18 foils to collect. Nine expansions, starter and boosters, 40 rares each and, of course, a parallel foil set (for the first six). More than 130 promos quite difficult to collect. 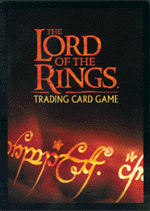 The art are awesome and if you love Tolkien you can't loose this game.